I am interested on your thoughts on this. I have been doing it for more than two years and have yet to see anyone else doing it. (I am used to being a trendsetter - NOT). Why do you kneel, do you have problems with your legs? Do you mean when paddling back out. Most of the guys up here do it. It's cool. Surf how ever you like. Trev wrote: Do you mean when paddling back out. Yes, with a paddle that is only long enough to paddle kneeling down. Why would I worry about looking dumb? OK. I see what you mean by the paddle. Just figured you were digging deep. So..... you paddle for waves kneeling? 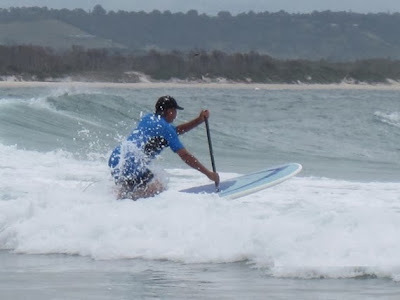 Most of the SUP riders I know who are any good make a lot of use of their paddle to radicalise their turns. The short paddle would seem to prevent that. Do you not use it once you're up and riding? Congratulations. You've managed to discard the only positive features of standup paddleboards and surf skis and come up with a new activity that distills the very worst of both sports. The site doesn't actually explain why it is beneficial to kneel instead of standing when paddling. It just says that you need a shorter paddle. BTW, that attached article about Laird falling off a SUP isn't correct - he is actually walking on water. Biggest kneeboard I've ever seen. The Not Standing Up Paddleboard.